Do a quick search online for any topic under the sun and you’re likely to find at least a dozen blog posts on it. Whether well-written or poorly flung together with keyword stuffing and a clickbait headline, it’ll be up there. The internet has become oversaturated with content, from the mediocre to the mind blowing, and everything else in between. And most of it’s free: YouTube tutorials, blog posts, podcasts, courses, etc. that provide unique and helpful content. To stand out as content marketers, we can’t just hit publish and hope for the best; we need a proven plan for producing valuable content that generates traffic and converts leads. As a content marketer myself I understand the challenges you face of not only having to come up with awesome content topic ideas, but the battle of getting it in front of your target readers too. Many people struggle to get eyes on their blog, especially early on. When I started out, I remember months of writing posts with almost no one reading them. It was like I was talking to myself. But as my blogging experience grew, I was able to learn the best strategies for creating content that delivers results. I fast learned that to rank highly on Google, or to build an audience by any means, you have to provide content that is extremely valuable and relevant to your readers. Google’s job essentially is to give searchers the most relevant and high quality search results, its algorithm has been designed especially for this. So, in other words, content marketing and SEO are basically becoming synonymous. When done right, content marketing is a great strategy for attracting, engaging and acquiring customers. The most important and most difficult first step to creating awesome content is knowing what to write about! Through my own trial-and-error I have found the best ways of generating blog topic ideas that provide value to your audience and will give you the results you need. The key to writing awesome blog posts is delivering exactly the content your audience is looking for. One of the best and easiest ways of doing this is to listen for frequently asked questions in everyday interactions, meetings, emails etc. This may seem obvious but not all bloggers do this. If a question comes up often it’s an indication that there’s a demand for widespread information on that topic. Really listen to your potential customers when you chat to them in person or on the phone. Read their email questions, pay attention to their comments and any problems you can solve. I use this strategy quite a bit. About 75% of the topics in my blogging book came about just from answering questions I received from people wanting to get started blogging and from browsing Quora to see what questions are commonly being followed. The next way to solicit questions is to browse Quora. Quora is a social question and answer based network, where people can ask any question they like and in turn respond to the questions of others. Its mission is to expand the reach of the world’s general knowledge through both experts and regular people. If someone asks or follows a question on Quora, this indicates that they want information on that topic and that there is a demand for that specific type of knowledge. 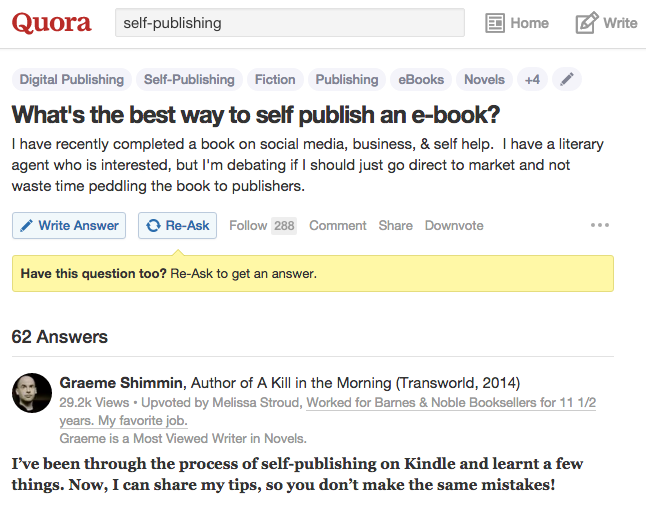 The question “What’s the best way to self-publish an e-book?” has a following of 288 people, this indicates that there is demand for this topic. Make the most of Quora by browsing questions within your topic area, or industry or within the problem that you are solving. You can then provide answers to the questions with the most followers through creating blog posts or on Quora itself. You can also share content from your website in topic-focussed boards on your profile to see how much traction they get. This doesn’t just apply to your own blog. Reading through comments on other related blogs or books can also help you to source and have a better understanding of customer content needs. Let’s say for example you come across an article on “How to Make a Living as a Freelance Videographer”, that goes into detail about how to make videos, how to find clients, etc. The blog post is a bit outdated and in the comments section readers are looking for more current advice about how to make it big on YouTube. Here’s your chance to fill a new content need. Write a post about making money on YouTube! Even if the answer may seem obvious to you, remember that just because it is something you know and understand well doesn’t mean everyone else is in the same boat. What is obvious to you can be eye opening for someone else. And reading through the comments section on yours, as well as other people’s, posts is an easy way to discover what people want to know more about. People are always actively seeking out information and you want your content to be the answer to those queries. Using these popular and relevant words and phrases can increase your chances of being found in searches, potentially gaining more traffic. People don’t always search for a specific product or service; they often look for information or solutions to problems. For example, per Google Keyword Planner, “productivity consultant” gets just 70 average monthly research, while “how to be more productive” gets 1,300. Keyword research is a proxy for people’s actual interests and buying behaviors. Both have to do with productivity, but one topic reaches a larger audience than the other. The slight tweaking of a few words can mean a big difference in sales or hits. Take advantage of this by doing a little keyword research. This tactic I like to call “scratching your own itch”. This basically means creating content to solve a problem that you have yourself. If you are in a similar position to your potential customers, chances are that if you have a problem, they have the same one too! This is actually a common tactic for creating startup ideas and for building products. I used this to develop an online course about engaging on Twitter, using it to generate traffic and automating the process too. After realizing there wasn’t much out there on this topic I created the content myself, assuming there must be others who had the same problem. I was right! Now, I’ve got a course to show for it, and I’ve helped many people along the way. When you teach something you recently learned, do it right away when the idea and process is new in your head. The longer you wait, the more you’re going to forget. Focus on the parts that were most difficult and confusing to you. You can also create content that you wish you had. Kind of like scratching an itch you had in the past. What is the book, the blog post, the video course etc. that you wish you had when you faced these challenges before? Creating that might provide value to others who are in that situation now. Have you ever seen a blog post on a topic that you wanted to write about and then decided you shouldn’t write about it because someone else already did? What if I told you you should do the opposite? If you see a product getting traction it’s validation that the product is something that people want. Similarly, if you see a piece of content that is getting a lot of traction, you could create something similar, because you know people actually want it. You have your own voice with your own angle, and that may resonate with people more. So, when potential customers read your content, you’re the one who comes off as the expert, and you’re the one that gets remembered for teaching them. But remember, never plagiarize! Write your post from a different perspective, include more information, make it even more valuable, compare it to another concept or write toward a certain audience etc. To find out what content is working you can also use BuzzSumo, search on Google, or browse the top sites in your niche. If you’re still really not sure what topics your audience wants you to produce content about, just ask them. Conduct customer development interviews, just like you would for any product. Ask them what their challenges are, what questions they have, what they would like the topic of your next blog post to be. This is where building an e-mail list can be especially useful. 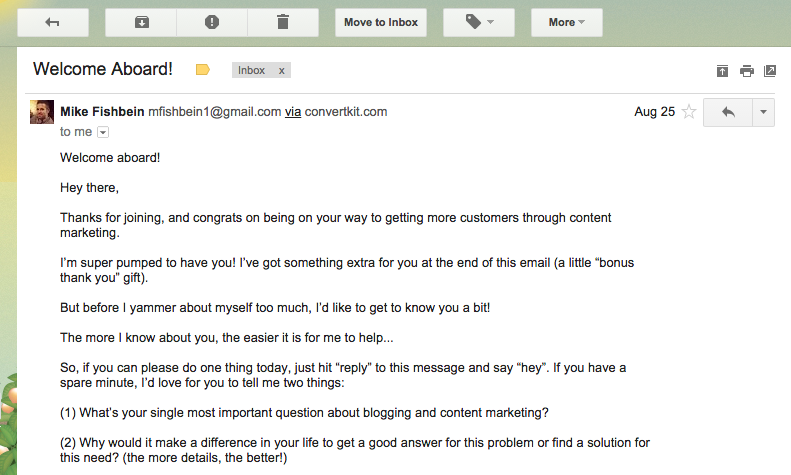 I use autoresponders to ask my list customer development questions which I then use for generating content ideas. Once you start hearing the same questions, that’s a clue that it is a topic you should write about. If this is the case, let the person know! They’ll feel special. This is another great way of finding out what potential customers’ questions are and then coming up with blog posts or other content to help answer them. This benefits other people who might have the same problem too. During office hours, people often ask me about specific blogging, writing, or content marketing tactics, how they can solve problems, or obtain general advice. This is great for audiences who are too shy or embarrassed to leave comments on my posts or to send a personal e-mail. Hosting office hours gives them a chance to speak what’s really on their mind. Now this doesn’t have to happen in an actual office! They can occur anywhere in person such a local coffee shop or even online via email, Twiitter or Skype. I’ve found SoHelpful to work really well for me. It makes it super easy for people to schedule time with me and vice versa, and it’s enabled me to get Skype communication with my audience, my potential customers. Creating content takes time. Your time is valuable. So, it’s smart to create minimum viable content before spending hours and hours creating the final product. Practicing iterative content development is like developing a minimum viable product (MVP) for a product. You don’t want to produce content that no one wants. So by producing iteratively, you can reduce the risk of spending a lot of time and/or money on content that won’t get you results. This is especially valuable and important for producing long form content such as a book or a video course. Produce a smaller piece of content first (minimum viable content), to validate that there is actually demand for that topic. If it gets a lot of attention, then it’s validated and you can write the post or make the video. If no one seems to care, you are probably better off writing about something else. Minimum viable content on a book or video course might be a blog post. Write a blog post summarizing all the key points you want to write about and see if that gets traction. Minimum viable content for a blog post might be a tweet or a Facebook post in a private group. You can also write a blog post about individual topics. If you are considering doing an e-book, maybe publish one chapter of that as a blog post and see what kind of responses you get. It’s not enough to just “put it out there” and hope for the best. If you really want to create content that strikes a chord with your customers, you need feedback to check you are on the right track. You can do this by either soliciting emails, asking for comments at the end of your post or directly asking customers what they think about your post and how you can improve it. Ask customer development questions so you can understand what your audience likes, dislikes, how you can improve the content, and what else they might want you to produce content on. Again, learn what people’s problems are and how you can best solve them. Remember why you are writing– to provide value. Learn to embrace criticism rather than shun it or shy away from it; this is a great way to learn what you need to do to improve. I embrace questions and all feedback whether bad or good; that’s how I make sure I’m improving everyday and giving my audience what they want. One way I test out an idea is by tweeting it first. If I think of an idea for a blog post, sometimes I’ll just tweet the title or some of the main points before I even write it. By doing this, I’m looking to see if people will reply or retweet. If there is engagement with my tweet, it’s an indication that there’s demand for that topic. I’m not necessarily going to choose whether to write a book or not based on immediate responses (or lack of responses) on Twitter, but this does provide some proximity, some idea of the demand for that kind of information. And of course Twitter can be an amazing marketing channel. Keeping up your engagement can help you build an audience that will become a marketing distribution channel for you later on. The success of this strategy also depends on your Twitter following. So if the only followers you have is your mom and her friends, don’t expect a sample tweet to provide much validation. As amazing as the web is for communication with audiences and sourcing content ideas, nothing beats face-to-face interaction. Teaching an in-person class is another favorite of mine as it enables me to actually practice my content and get immediate feedback. Having your customers right in front of you is a great opportunity to ask them direct questions. 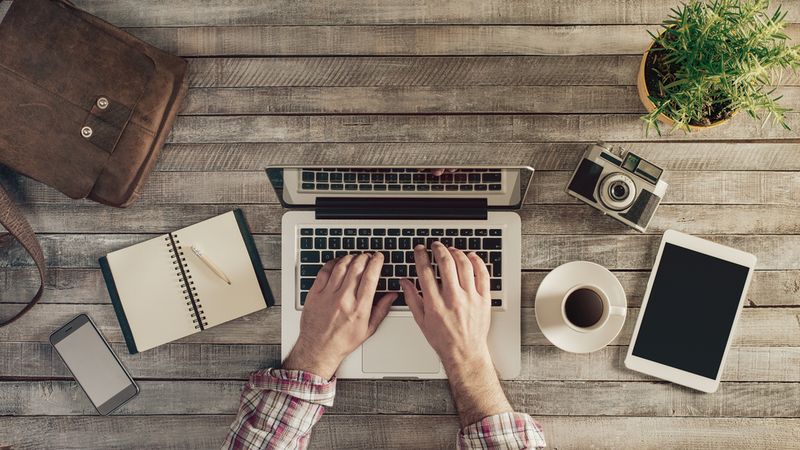 If you’re a blogger, you’re a writer, but you’re also a teacher. You’re helping people solve a problem. You’re teaching them. This is how I developed my book, How to Build an Awesome Professional Network. It started out as an in-person class. Yet, I didn’t even decide to do the in-person class until I had written a few blog posts that were getting good reactions from people first. In total, I taught it over ten times. But I altered it several times, based on feedback I would get. After about the seventh time, I felt like I had iterated on it so much that it was really solving everyone’s problem and truly delivering all the value and answering all the questions that they had. “If you build it (content) , they will come” isn’t always true. Sometimes you may build it and they won’t come. But, sometimes, you don’t have to build all of it. Rather, “if you show everyone the floor plan, design, and vision, they will come”. Use this thinking to your advantage. This is another great way to get in front of your audience and get feedback straight away. Similar to teaching an in-person class, a webinar enables you to get qualitative feedback from your audience. It can also help to talk your content out loud. It’s interesting– when you’re writing something, it may seem coherent and make complete sense in your head, but reading it aloud can show you new ways to improve upon it. Remember, your audience should be at forefront of everything you do or write! Ask questions and get feedback during the webinar and always allow time for others to ask questions too. Afterwards you could send an email with a survey or even ask people if they would hop on a call with you to discuss the content further. Teaching a webinar is like teaching a class, but these days, it’s easier and more scaleable. All you need is an internet connection, and you can get in front of as many people as you want! If you’re not sure how to teach a class or a webinar, start by attending them. There are plenty of free webinars going on at any given time. Sign up for one so you can get a feel before you dive in head first. Randomly, comedian Louis C.K. will drop by a small open mic in New York City for a free set so he can test his new jokes. Why? He wants to make sure they’re funny (valuable). It’s much safer for him to try out his new material on a crowd of 200 rather than a crowd of 20,000. These small audiences are his beta readers. The better the content is, the better it’s going to attract, engage and acquire your customers. The more valuable it is, the more likely someone will share it on their social networks, blog about it or link to it. This is a big way to build your SEO. Having “beta readers” is a great way to ensure your content rocks. Have people read your content before you publish it and get feedback after you publish it too. Just like Louis C.K. practices his new jokes before he includes them in his DVD, you should test your content out before publishing it to the world. These can be your friends, colleagues, family members, or your audience. Just make sure you trust their judgment and that they don’t just respond with, “It’s great. Perfect. Don’t change it at all!” That defeats the purpose entirely. Tell them to be critical. Ask people what they liked and disliked, and what could be improved. Asking questions and getting feedback is important. If you don’t do that, having beta readers isn’t helpful at all. Content marketing, if done right, can be an amazing way to get traffic and customers. It can be very low-cost and highly sustainable, especially as opposed to, say, PPC ads or sales. In an ever increasingly competitive world, it’s more important than ever to produce content that is unique and truly solves a problem or meets a need. If you do that, people will find you, share you, engage with you, return to you, etc. To get results, you need to create content that’s valuable to your audience. However, the most valuable piece of content can be useless if it’s not in front of the right people. Go where your audience goes. Whether it’s Udemy, YouTube, Slideshare, Quora, Amazon, you name it. Create content to suit the platforms your readers spend most of their time on and engage with them there. Don’t just produce content for the sake of generating traffic. Produce it to get results. Build your email list to create a marketing funnel. This way, you can continue to re-engage and market to the traffic you acquire. Being creative isn’t always the best way to come up with awesome content topic ideas. In fact, sometimes, going out and getting the ideas and letting the questions come to you can be better. The best way to get ideas is by interacting with your readers, getting questions and feedback, analyzing search volumes, and seeing what is working in your industry. Using the strategies and tactics discussed above you can reduce wasted time and money spent on content that doesn’t provide value to your audience, and increase your ability to get traffic and conversions.